Because of his long term ties to Caltech, world renowned physicist Stephen William Hawking (born January 8, 1942, which was 300 years after the death of Galileo) visits Los Angeles once a year. He spends about a month each year at Caltech as the Fairchild Scholar, carrying out research and exchanging ideas with faculty. He also delivers a public lecture while he’s here and I make sure I always attend. Given his nearly life-long affliction with Lou Gehrig ’s disease (amyotrophic lateral sclerosis, or ALS), he was not given a long life expectancy so I go to see him every chance I get. This year’s visit on Monday, March 9, 2009 was handled a bit differently than prior years. In the past, Caltech based Hawking’s lecture around the famed Beckman Lecture Series, a favorite of mine each academic year. The only problem is that Caltech’s Beckman auditorium, although quite large, is simply not of a sufficient size to accommodate all the people wishing to see the professor. This year, the event was held at the new Pasadena Convention Center. The convention center is located nearby Caltech and is significantly larger than Beckman and with ample parking. The new building was perfect for Hawking’s visit. This year, Caltech sold tickets to the event for $10. Previously, the event was free but this resulted in extraordinarily long lines and attendees were not guaranteed entry. One year I recall waiting out on the lawn are in front of Beckman for over three hours, only to be told the auditorium was full just before the start of the lecture. Luckily, they opened an adjacent auditorium with a video feed for the overflow crowd. The second auditorium was also packed to capacity and quite a few people were left out completely. On the night of the lecture I got to the convention center about an hour early so I could savor the event before it started. I walked up from the underground parking to the front doors of the convention center and sat down to observe the crowd as they arrived. The mood of the people arriving could only be described as electrified. Everyone seemed excited at the chance to see the most famous physicist in the world. People from all walks of life showed up. There were many children in attendance too which I viewed as a very positive thing since such an event would be remembered as a once-in-a-lifetime experience. With about ten minutes until the start time of 8pm, I found a good seat directly in front of the stage. I sat next to a nice couple. The man was head of the Caltech energy plant. I think a good percentage of the Caltech community attends the Hawking lecture each year. At 8:15pm I was starting to get worried, but at long last the professor made a grand entrance on his motorized wheelchair from the rear of the immense auditorium. The event was completely sold out, and there wasn’t a single empty chair. 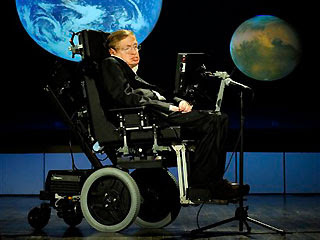 With the help of assistants, Hawking made it up to the stage and began his talk “Why We Should Go into Space.” It takes Hawking a very long time to compose his words using a computerized speech synthesis device developed by Intel. The pre-recorded lecture lasted about 45 minutes and then there was a Q&A session that was also pre-arranged. It was very satisfying to spend an evening with Stephen Hawking and thousands of his fans. Hawking is probably the most curious character alive today, so as a physics groupie, this was the perfect place for me. Since 1979 Stephen Hawking is the Lucasian Professor of Mathematics at Cambridge University, the same post held by Sir Isaac Newton. Hawking is perhaps best known for his discovery in 1974 that black holes are not completely black, but instead emit “Hawking radiation,” and for his “no boundary” conjecture about the details of the birth of the universe. Stephen Hawking has three children and three grandchildren. you cannot compare Stephen Hawking to the other scientists,because he is the scientist of the century!!! !